Posted by Pam in KC in designwall, UFO Challenge 2011. Posted by Pam in KC in UFO Challenge 2011. 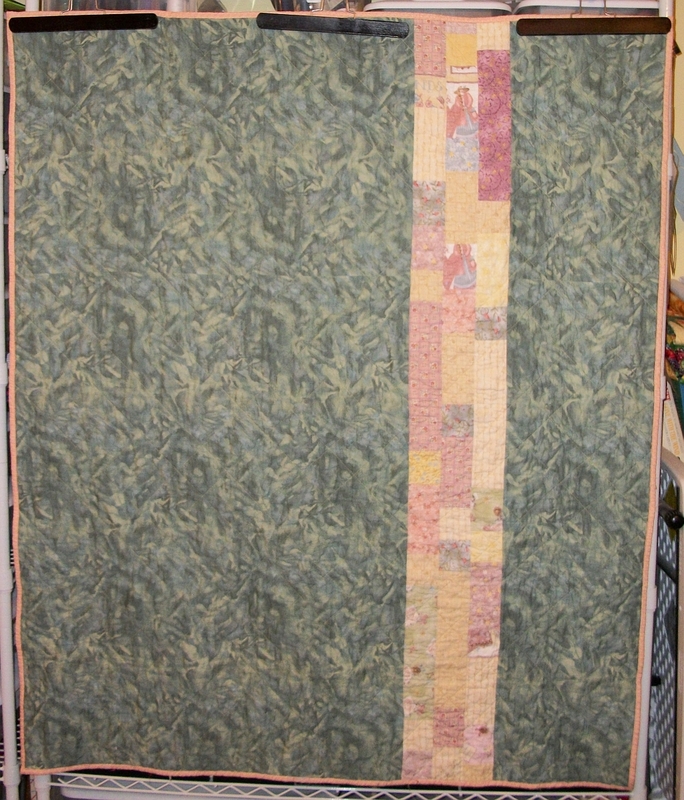 Yes, I’ve finally finished the seam on the back of the Green and Cream quilt. 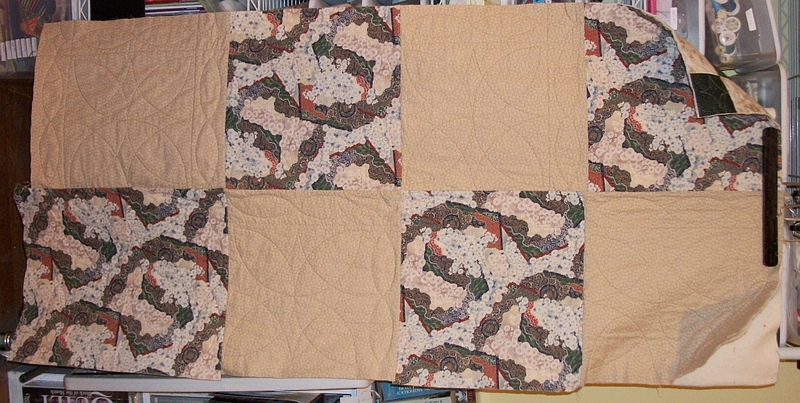 Of course there are three more rows to do, but the challenge was just to ‘finish partial finished rows‘. I can now in good conscience set this aside and do something else from my bag of “UFO Quilt Steps”. I promise this was not rigged. 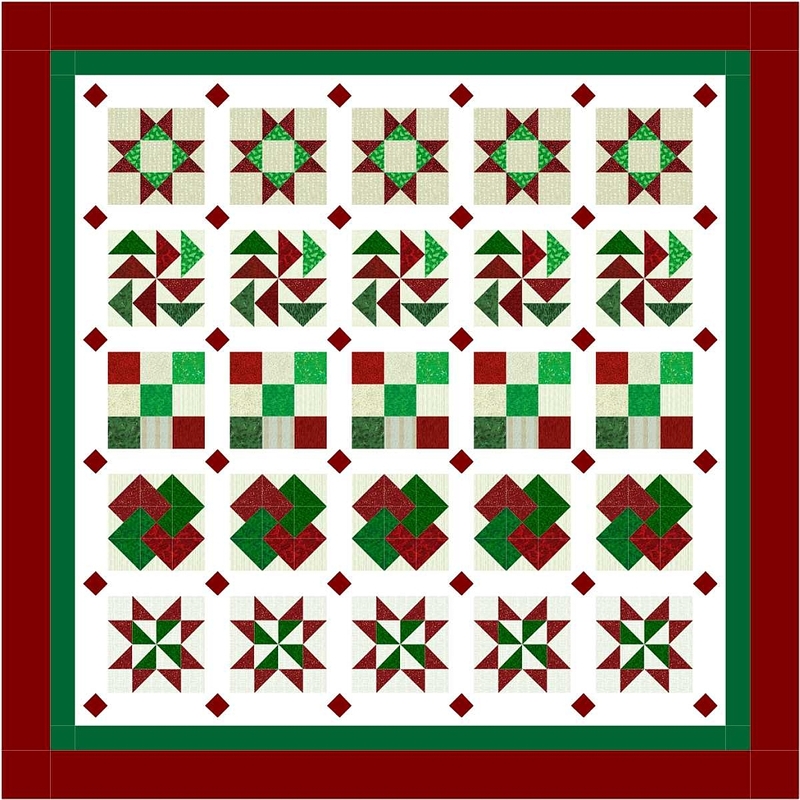 Well, admittedly I didn’t put the next step of the Green and Cream quilt in the bag until I pulled the next challenge, but still. Since I finally settled on a design for the Row Quilt and bought the fabric last week, I’ve been itching to work on this quilt. I knew if I had the fabric washed, I couldn’t hold back, so now I’ve got to wash the fabric so I can start making those square in a square blocks. 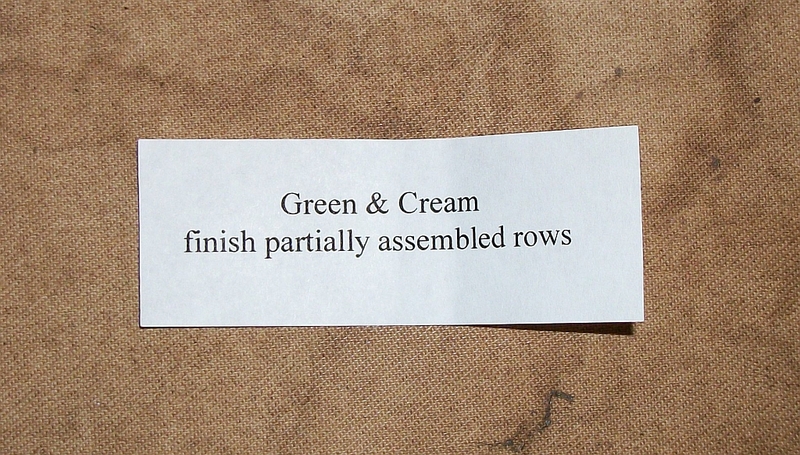 Of course I’ve not totally focused on the Cream and Green quilt. 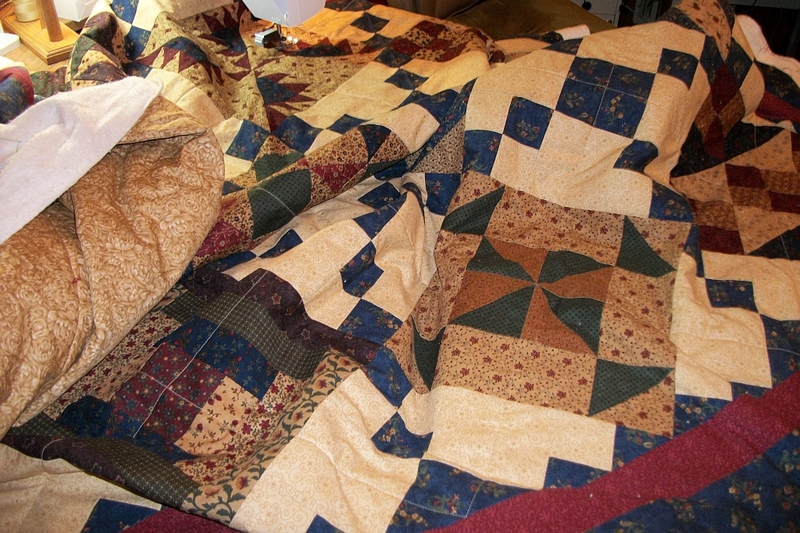 I was supposed to be quilting the Crossword Puzzle quilt, but got stymied when I discovered the backing scrunched. So I worked on Mom’s Chain of Stars, this month’s UFO. Yesterday I decided to quilt the Crossword Puzzle quilt on the longarm and now have a rental appointment. But what to do with the sticky batting? 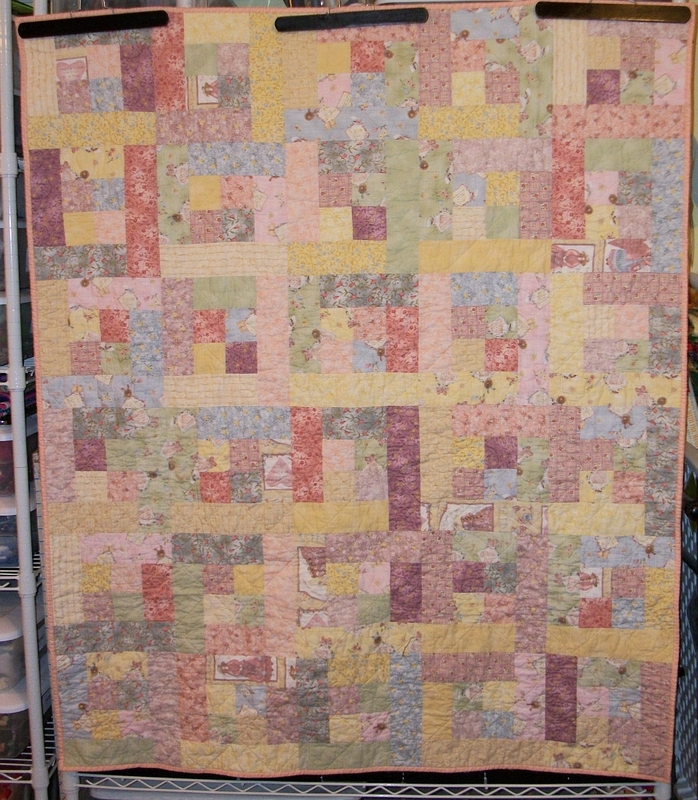 Cut it up and work on baby quilts. Mom’s Chain of Stars is now quilted, bound and labeled. 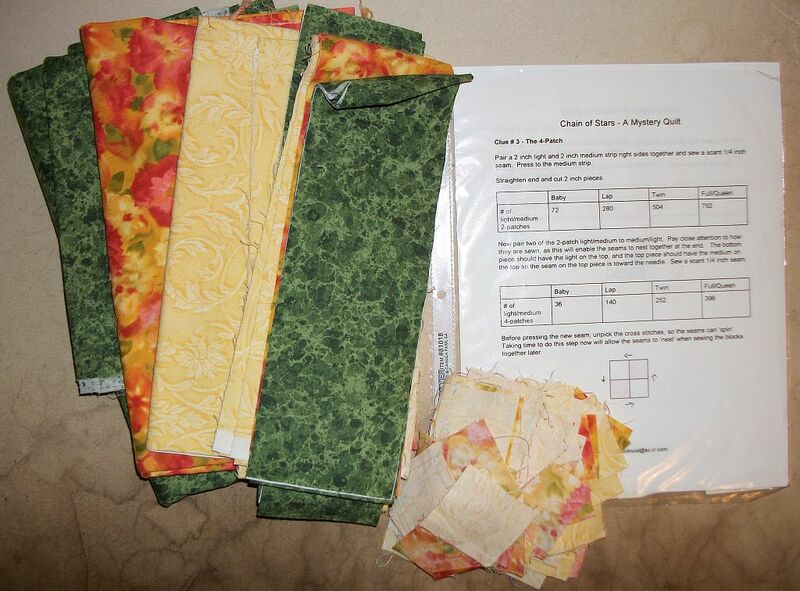 Since I need to wait for the Row Quilt fabric to wash, I’m going to see about quilting another baby quilt. I still have a lot of sticky batting. I finished the top. In the morning I think I’ll quilt it. Judy, over at Patchwork Times has picked the UFO # for August. It is # 7. #7 on my “complete the top” list is a peach and green Chain of Stars — the same pattern as July’s UFO finish. After I wrote the pattern I asked my mom to test it for me. This is as far as she got. 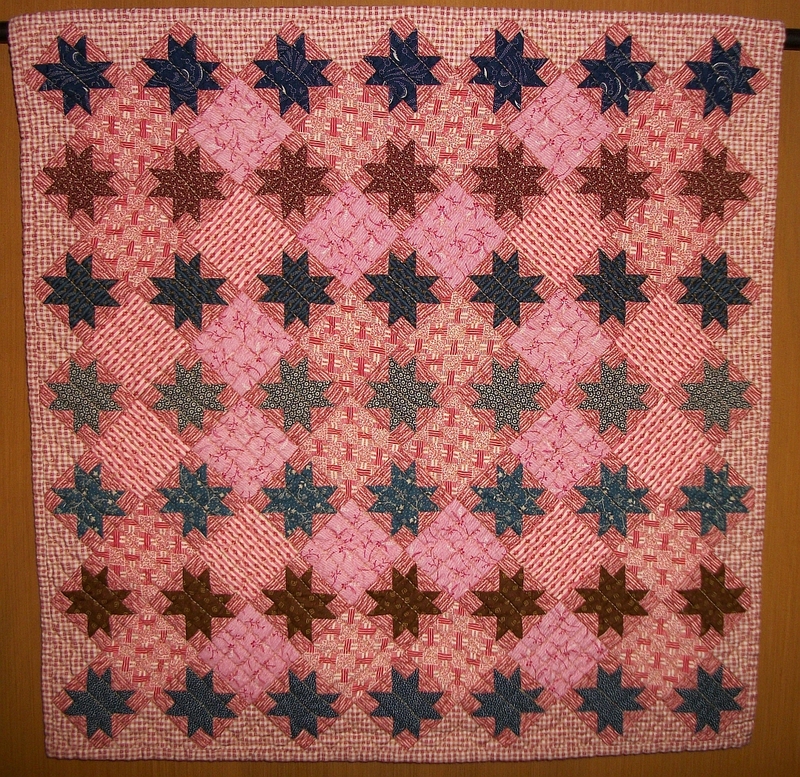 My intention is to finish it and then give it to the next great grandbaby – if it’s appropriate. 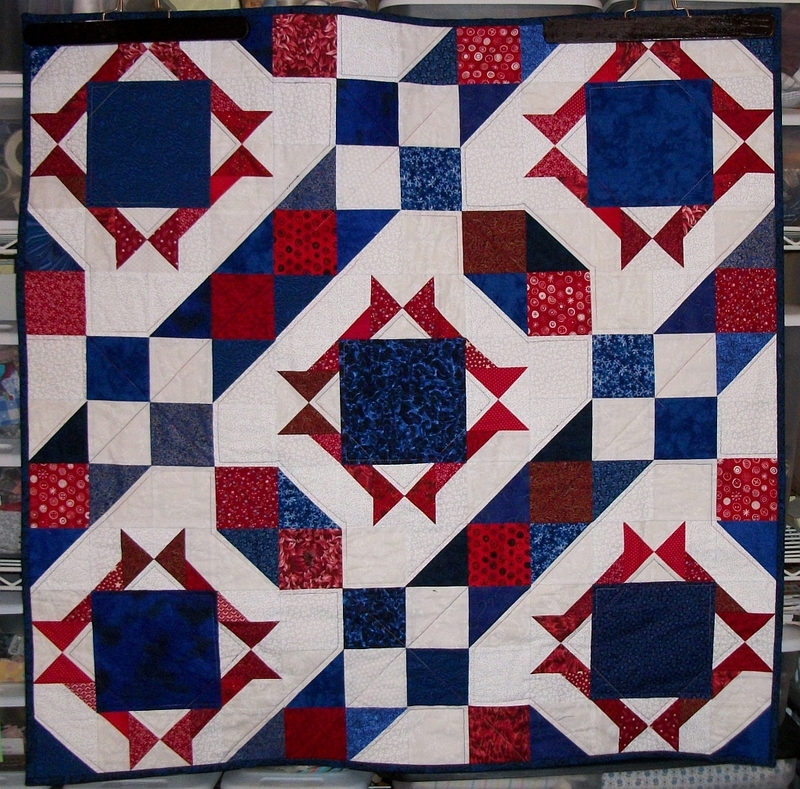 On the ‘to-be-quilted’ list is Red, White & Blue Baby 2. It’s not listed as #1 on my list, but I finished #7 off this list back in March. Stay tuned to see which one — if either I work on this month. In the meantime I’m off to finish sandwiching the Crossword Puzzle quilt, but you can check out what others finished off their UFO list over at Judy’s. 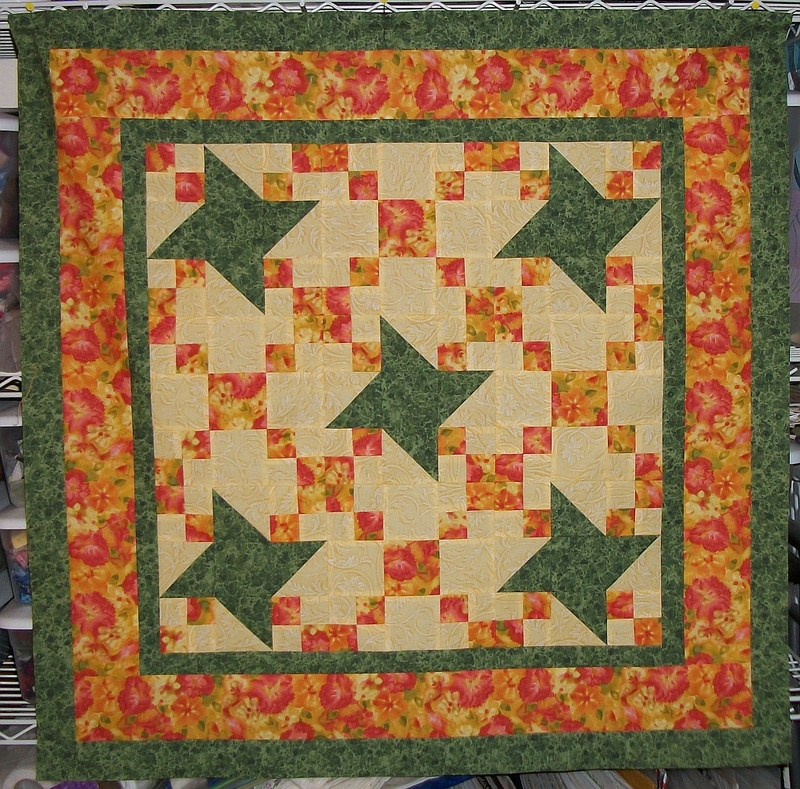 Posted by Pam in KC in Challenges, designwall. There’s nothing on my design wall/floor/table today. I’ve finished* all of my challenge quilts. Click on the picture to enlarge it enough to see. You should be able to click on it a second time to make it even larger. * Needs to be fixed, quilted, bound and labeled — but the top was done by the wedding, which was the original goal when I started it in October. 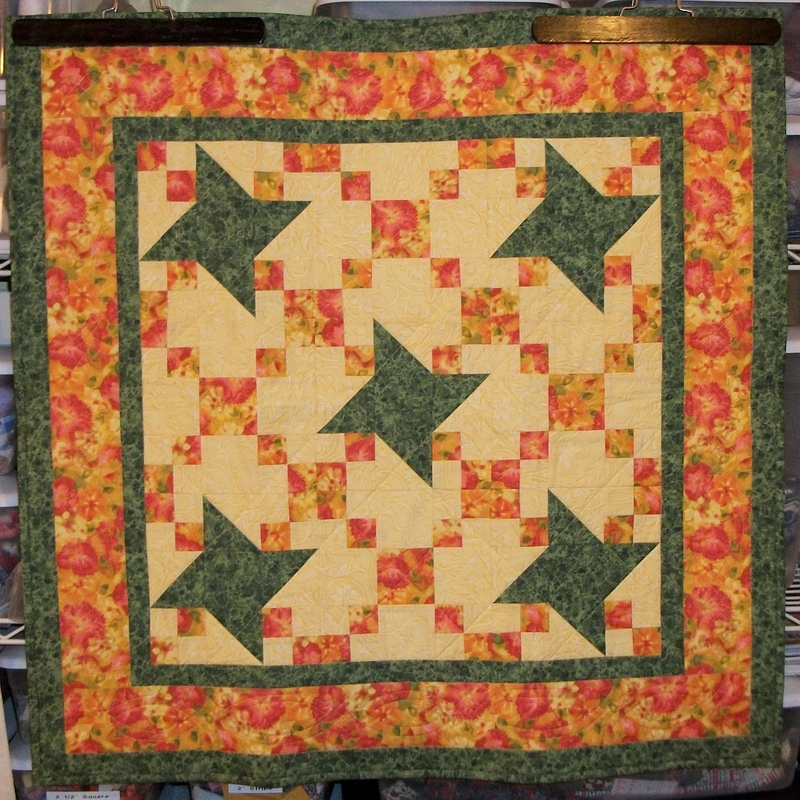 Judy has link’s to other design walls on her blog – Patchwork Times. 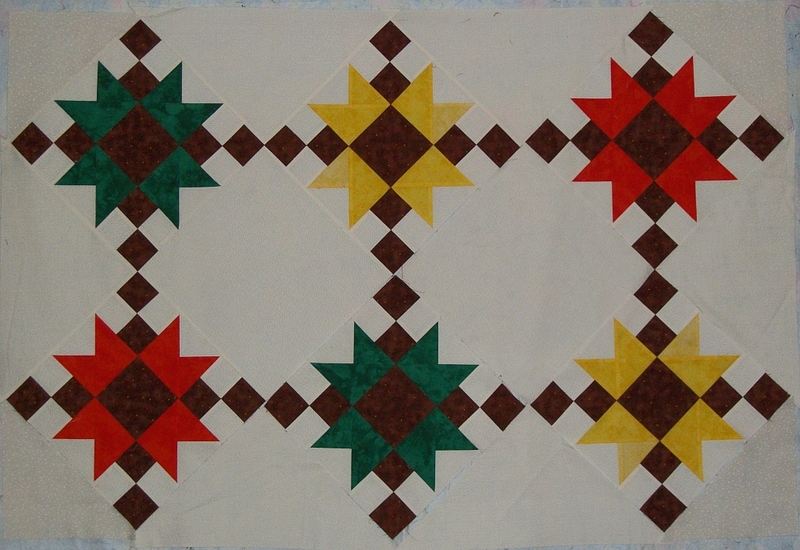 Today I’m quilting Kansas Spirit. 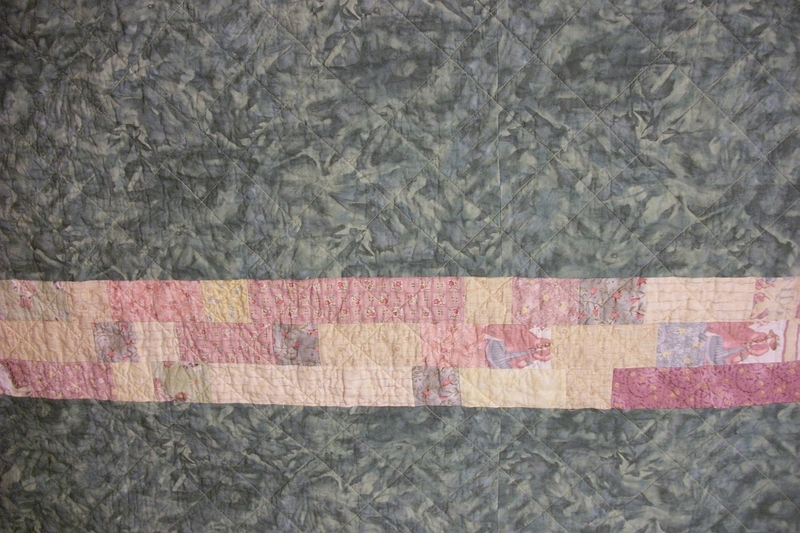 It’s the last of the quilts which need to be quilted by the end of the month. Miniature Ohio Star – Done! Neutral Strip Twist – Done! The Chain Event – Done! 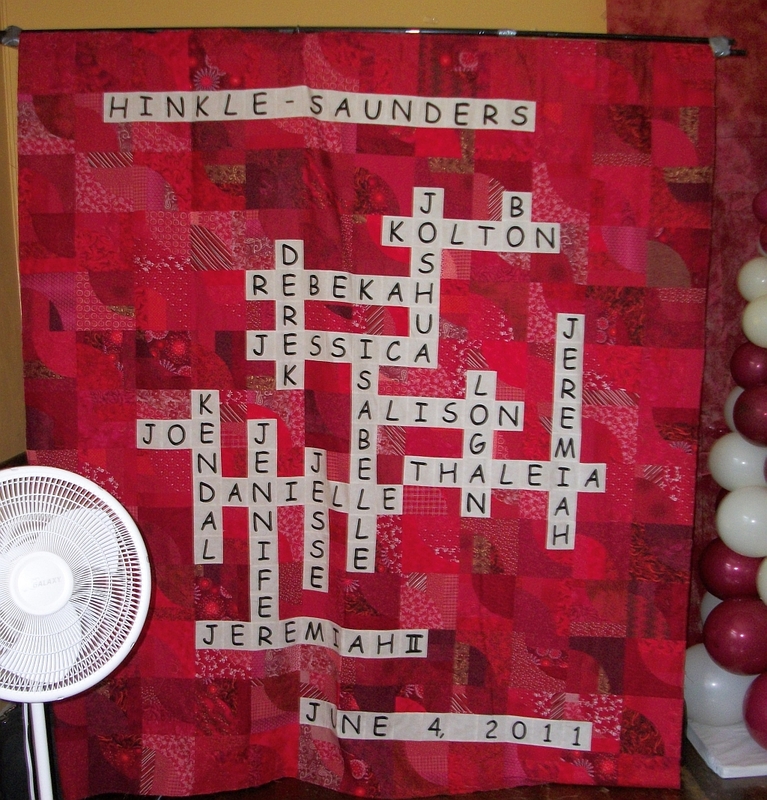 * Crossword Puzzle will be quilted in July. I’ll post pictures over the next couple of weeks. In the meantime check out other design walls by following the links over at Patchwork Times. Posted by Pam in KC in Challenges. 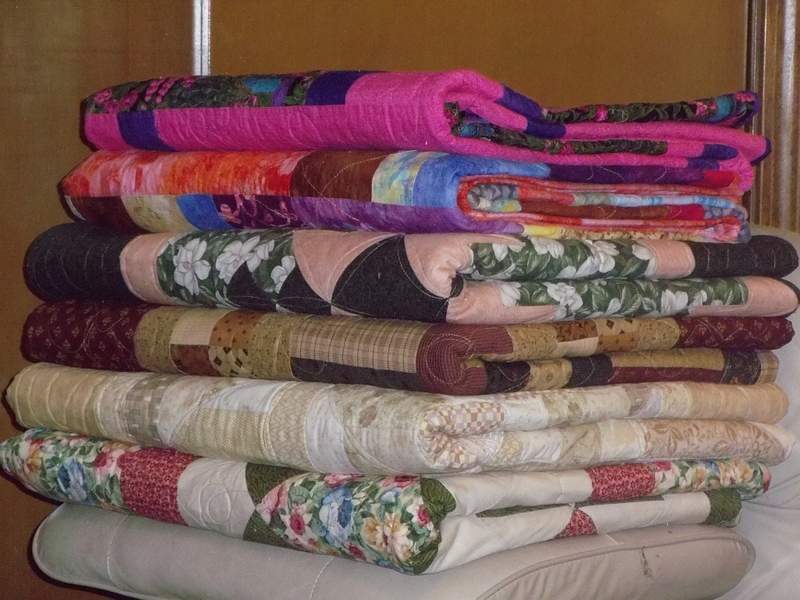 The quilts I just finished still need to be washed and have their “portrait” taken. I’ll do that over the next few days. 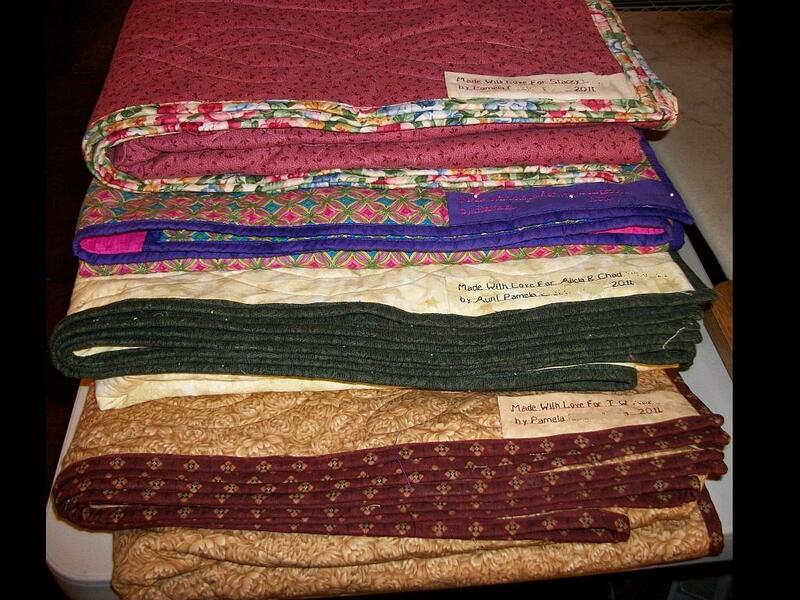 I still have one more quilt to quilt, bind and label by Sunday. In the meantime I’m off to the grocery store. The pantry is getting bare. 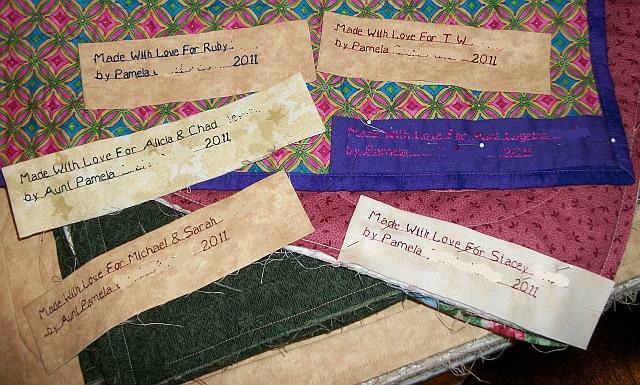 Three quilts now have their bindings and 4 have the labels stitched down on two sides.